Chris and I have been trying to get up early and make breakfast together. It's a nice way to connect with each other in the morning, I make breakfast while he makes coffee, then we sit and eat at our kitchen table and talk about random things. I've been making this breakfast a lot lately, it's an old standby that I'd forgotten about, but it's really easy and quick. 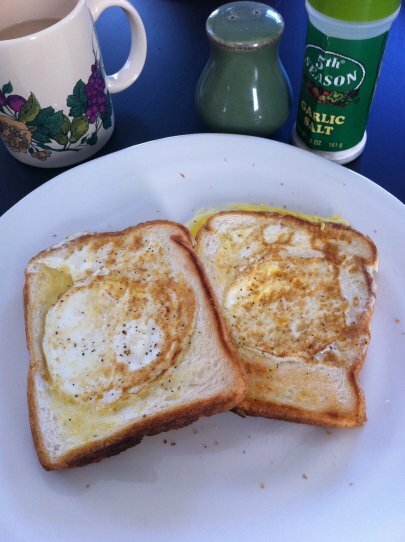 I don't like making breakfast usually because it's a lot of effort, but this is so simple! You've probably heard of it before, I learned how to make it in 6th grade HomeEc! But in case you haven't, here it is! 1. Cut a hole in the middle of the slice of bread. It should be about two inches in diameter. 2. In a large skillet or frying pan, melt enough butter to coat the bottom of the pan. 3. Lay your bread down, leave it alone for a little while to start browning. 4. 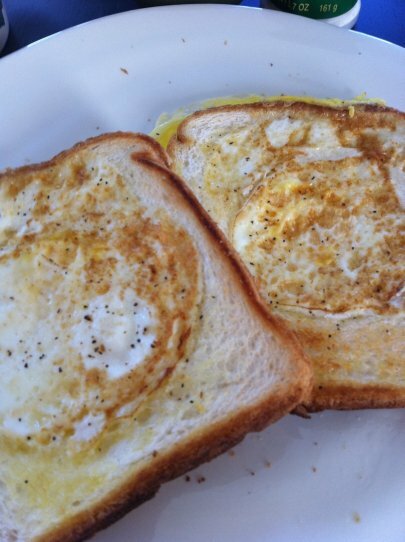 Crack your egg into the hole. Season with salt and pepper. For mine, I break the yolk right away, but Chris likes to keep the yolk in tact. 5. Cook for about two minutes, then flip over carefully. Add more salt and pepper if you want. Cook for another two minutes or so. 6. You can toast the round piece you cut out in the pan and serve it with the One Eyed Jack if you want! Yumm, that looks so delicous!! 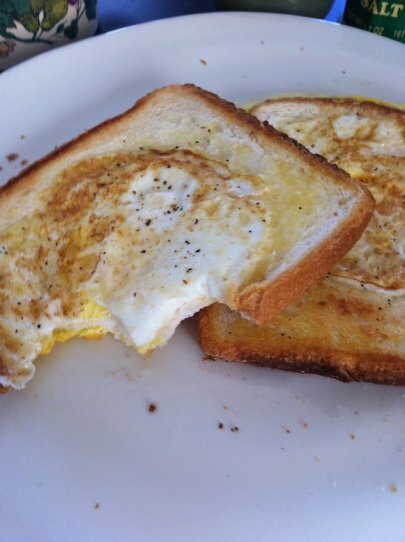 Its kind of like an egg sandwich, which I love lol. That looks so yummy! I've never heard of it, but I definitely want to try it now. This was one of the very first things I learned to cook! So deliciously simple.